Unfortunately for Sathya Sai Trust spokesman V. Srinivasan and his (and Sathya Sai Baba’s) already badly tattered credibility, last Sunday, still more treasure was found in secret places in Sai Baba’s private quarters. This time, the joint District Collector and her team searched for and found it. But, in a case of caught-out-yet-again, this lot of treasure DID NOT appear in the Trust’s inventory, which the government of Andhra Pradesh had put the Trust on its Boy Scout’s honor to make. Did the District Collector and her team obtain their spectacles or magnifying glasses from a manufacturer much superior to any the poor Trustees can manage to find? “According to sources, during investigation, it was found that Pradhan, a retired Air Force official, brought Rs 35.5 lakh out of Yajurveda Mandir, Sai Baba’s personal chamber, and handed it over to Sathya Sai Central Trust members RJ Ratnakar and V Srinivasan at the Shanti Bhavan. The cash was in turn given to Chandrasekhar, driver of Srinivasan, and later, was passed on to Sohan Setty and Harish Nanda. The trio was caught by the police on Saturday night while transporting the cash to Bangalore. Police are likely to serve notices on Ratnakar and Srinivasan in a day or two, the sources said”. 1. The Sai Trust markedly departed from its policy of donation by cheque with the administration’s issue of receipts. 2. Perhaps all the more strange in a (so-called) spiritual organization which should have a tender care for the safety of its workers is the considerable security risk to which Srinivasan and any other accomplices (like the Puttaparthi head of Security) were ready to expose Srinivasan’s driver, Chandrasekhar, and the Shetty brothers. 3. Commonsense and caution, following nation-wide attention on the enormity of the first, and truly vast, treasure cache, should have set in. The risks Srinivasan took can hardly be stated. Who would be so imprudent? What lawyer would ever countenance such folly? Yet Trust spokesmen are often enamoured of stating what depth of experience and talent subsist in its Trustees. “I do not see any need for the government to set up a separate mechanism”. But clearly succumbing to a changed reality, where Puttaparthi is no longer shielded from public accountability, he added that he saw no problem if the government should wish to set up a mechanism of accountability. IF …..! Surely, not ‘if’ – but when. A high level business group CEO, Srinivasan cannot be so simple-minded as believe in such and IF. He gives every evidence of temporizing and trying to play to the naive masses. The then Indian Prime Minister Narasimha Rao and his Home Minister S.B. 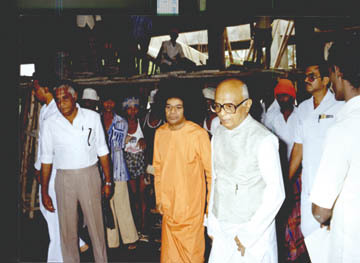 Chavan and other powerful forces in Indian politics aided Puttaparthi’s extensive cover up of the police killings in Sathya Sai Baba’s bedroom. We know (via the testimony of V.K.N. Narasimhan, editor of Sanathana Sarathi) that Chavan was in Puttaparthi assisting in the damage control. A former Andhra Pradesh Home Office Secretary, V.P.B. Nair told the BBC of the massive cover up that prevented police, media and judicial investigation. The Anantapur Journalist’s Union protested the suppression. “The money belongs to the Trust”. He said that there could be no more gold, silver and other valuables in the Yajur Mandir. All along Srinivasan has given out accounts as though they are indisputable facts, only to be falsified by the facts. Like his ‘spiritual master’, in fact, as analytical studies of Sai Baba’s discourses and other documentation clearly show. In passing, it is interesting that there is no record of Srinivasan saying a thing about any of the many other places in or around Puttaparthi where treasure may, or may not, be hidden – for example, secreted behind walls or in ceilings or in cement tunnels. Such genuine care, accountability, transparency and due diligence are not to be seen in him or this fellow. Trustee V. Srinivasan (right) of the Sathya Sai Central Trust speaking to the media at Puttaparthi on Tuesday. Member of the council of management Naganand is also seen. PUTTAPARTHI: The Sathya Sai Central Trust categorically stated here on Tuesday that the cash of Rs.35 lakh seized at the Kodikonda checkpost by police recently did not belong to the Trust but to 12 different people. Trustees R. J. Ratnakar and V. Srinivasan, who were in the thick of controversy following seizure of the cash, had only facilitated the money being placed before the regal chair of Sathya Sai Baba in Yajur Mandir. Mr. Srinivasan explained at a crowded press conference in Prashanthi Nilayam that the Trust did not wish to get involved with the finances of the construction of the Mahasamadhi as it was a public charitable trust and that the law did not permit them to undertake religious activity. He said the Trust had decided not to directly undertake the construction but facilitate the devotees to do so under its supervision to ensure quality and aesthetics. The Trust took this decision as it was flooded with offers from devotees to pay for the Samadhi work. Shankarnarayana Consultancy Company of Bangalore was appointed as project consultant. Mr. Naganand — member of the council of management of the Sathya Sai Central Trust — said there were no restrictions on people giving donations in cash to a consultancy to be used for the construction of the Mahasamadhi. He added that the said company was no stranger to Puttaparthi and had in fact even donated work worth crores of rupees, even when not asked for, out of devotion to the late Sathya Sai Baba. Asked if the Trust would be compliant if the government decided to take on a monitoring role over the Trust, Mr. Srinivasan said, “I do not see any need for the government to set up a separate mechanism”, and that if and when such a decision was taken, the Trust would not have a problem. He said even without a demand note from the Income-Tax Department, they had paid Rs.9.75 crore as tax on the income attached to the inventory of valuables found in the Yajur Mandir. HYDERABAD: Breaking his silence for the first time since the seizure of R35 lakh of Sai Baba’s money, Sathya Sai Central Trust member V Srinivasan vehemently denied allegations of wrongdoing and said the amount was meant for a legitimate purpose: building the guru’s samadhi. This entry was posted on July 6, 2011 at 9:27 am	and is filed under Uncategorized. Tagged: Andhra Pradesh, Corruption, Crime, India, Indian media, Religion, Sathya Sai Central Trust, Sathya Sai Organization, South India. You can follow any responses to this entry through the RSS 2.0 feed. You can leave a response, or trackback from your own site. It’s mind boggling how an empire was built on deceit, falsehood, willful self deception, brainwashing and so on. When we see high ranking officials and highly educated people and so many non Hindus and foreigners surrender at Baba’s feet, the first thought that comes is ‘How can millions be wrong? This is certain divinity”. But millions can be wrong. Remember the time when Galileo made the statement about the Sun being the center of the Universe? The whole world was wrong in their thinking. Galileo was condemned to prison until death for daring to say something contrary to popular belief. Devotees who refuse to hear anything other than Baba’s divinity are the most pitiable. They live in an euphoria that never exists. They discredit all corruption and molestation stories because it didn’t happen to ‘them’. They must realize it is physically impossible for one man to molest the millions. If a murderer didn’t kill you, can you swear that he is a good person? Intelligence should overcome emotions and delusion. You can talk sense to someone who is ready to open the window to let the light come in. But how can you help those who enjoy ignorance? God has also given us intelligence. Why not use it a little?